Gareth Widdop is expected to join Warrington Wolves for the 2020 Super League season. Gareth Widdop is set for a return to England in 2020 after signing a three-year deal with Warrington Wolves. The Halifax-born NRL star had been linked with a move to Super League after expressing his desire to play in England, while still at the height of his career. Gareth Widdop in action for England. He will now be leaving the remaining two years of his contract with St George Illawarra to sign for the Wolves. Widdop had previously reaffirmed his commitment to remain with the Dragons for at least one more season and is understood to be taking a pay cut to secure a move to Super League. 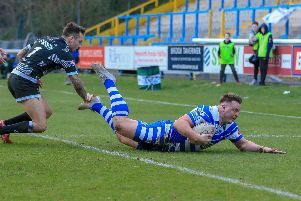 The current England international said: "I’ve been away from home for a long time now, and growing up in Halifax I always had dreams of playing in Super League. "I’m at the stage in my career now when I have that opportunity. "Simon (Moran), Karl (Fitzpatrick) and Steve (Price) have given me that opportunity to come home and live out a childhood dream. I’m really excited for that. "It’s a long way off yet but it’s something I’m looking forward to. “With my experience of playing in NRL, and having been lucky enough to represent my country, I am hoping I can draw from my leadership and bring that to Warrington." Wigan Warriors, Leeds Rhinos, Huddersfield Giants and St Helens were all believed to have been interested in landing Widdop. He will now, however, join up with former coach Steve Price, who brought Widdop to St George from Melbourne Storm in 2014. The 29-year-old was born in Halifax before emigrating with his parents to Australia when he was 16. He played his junior rugby at King Cross Park and is also an ex-junior at rugby union side Old Brodleians. Widdop has earned 24 caps for England and will now return to his homeland after one more season down under.